During the First World War Florence Blythe-Brown worked at the military hospital in Hampstead. 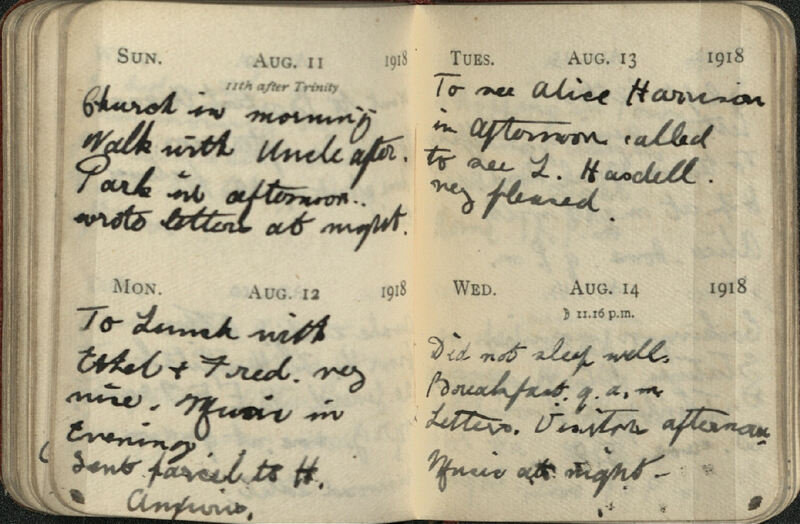 She recorded her work and social life for 1917-18 in two diaries. 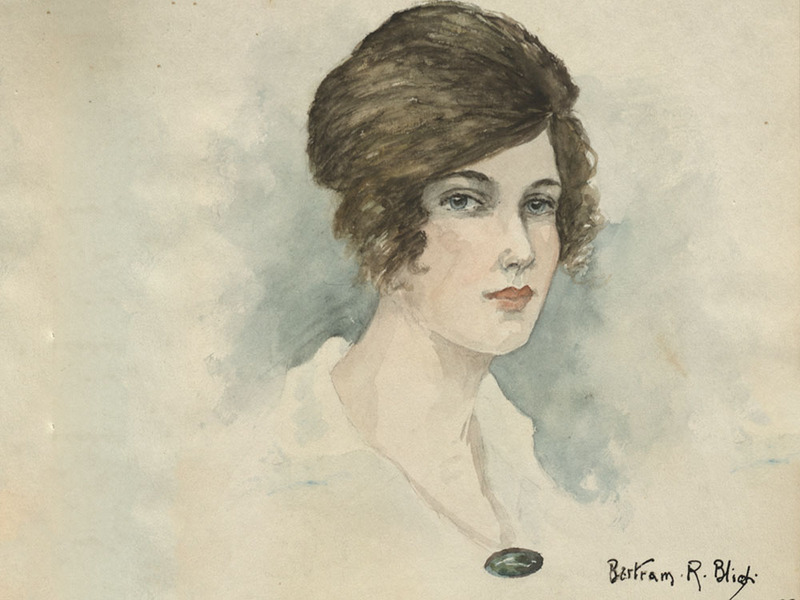 From 1915 onwards, she also kept a scrapbook in which she collected drawings and writings from the soldiers who were brought to London after being wounded at the front line. This collection opens a window onto the daily life of Blythe-Brown the nurse and shows us some of the thoughts and artistry of her patients. 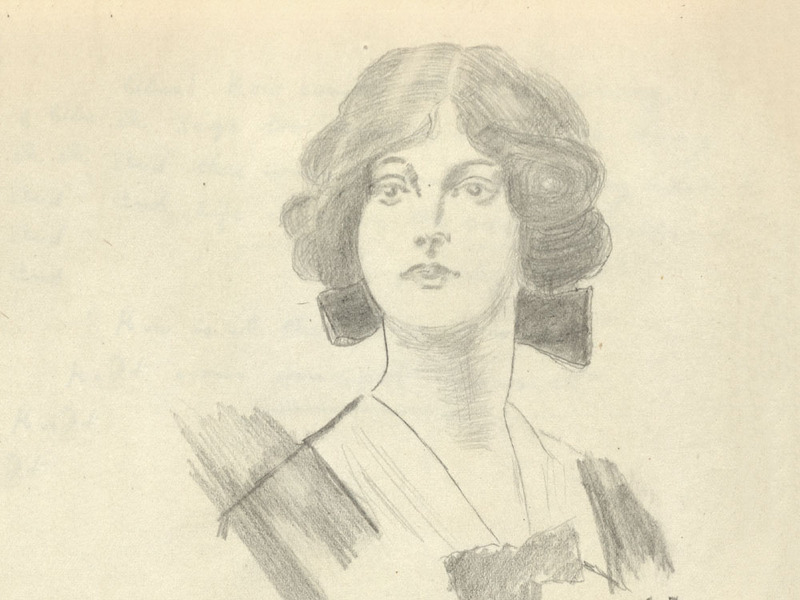 Florence Mary Virtue Blythe-Brown was born in Northampton in 1887. At the age of fourteen she was working as a dressmaker in Northampton. She continued in this profession for a further ten years at least. 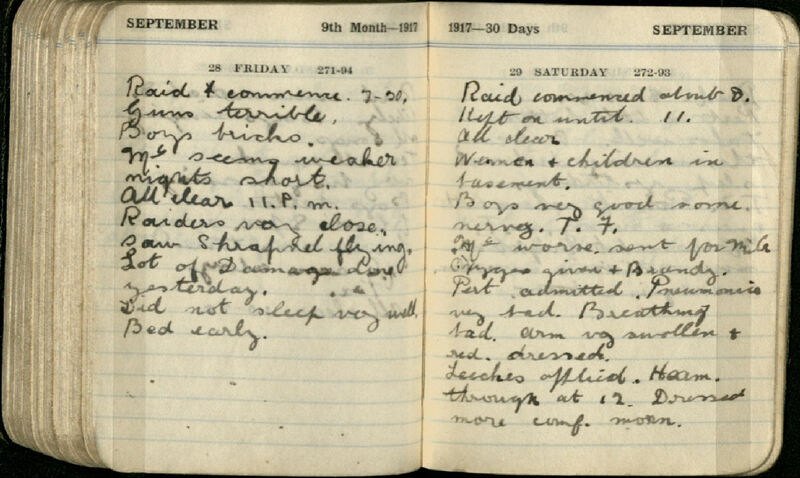 According to anecdotes from her friend’s daughter, Mary Rush, she had some nursing experience prior to the First World War. However, there is no documented evidence of this, and the first official papers show she trained at the New End Hospital and Workhouse infirmary in 1914. At the outbreak of war this was swiftly changed to Hampstead New End Military Hospital, and its inmates were moved to Marylebone workhouse. 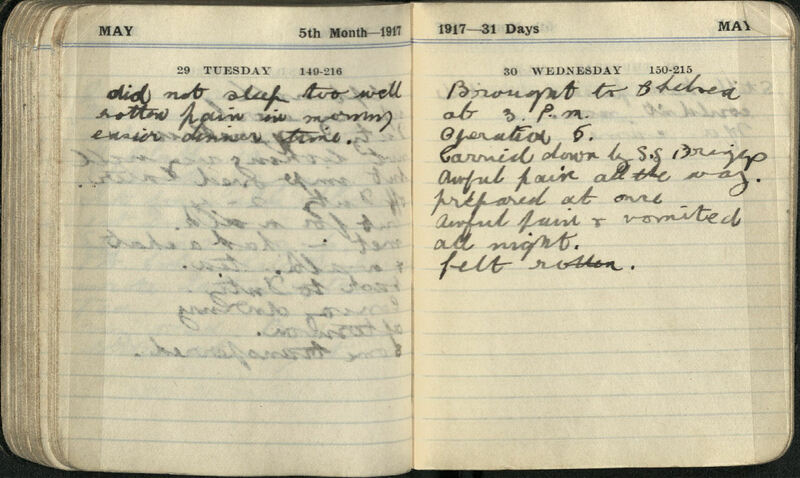 The hospital specialised in shell-shock and took part in research for trench fever. The scrapbook dates from 1915 to 1919 and contains writings and illustrations, including drawings of regimental badges and some poems about the war. Many sign their name and regiment, revealing just how widespread the war was. Blythe-Brown nursed soldiers shipped from Australia, New Zealand, Canada and Ceylon (modern-day Sri Lanka). The Nursing Times ran a piece on New End Hospital staff in 1918. Perhaps one of the nurses shown here is Blythe-Brown? There are four portraits of some interest in the album, and although there are signatures or initials attached the subject is not named. There does seem to be a similarity between the pictures - are they portraits of Blythe-Brown? One poem describes her as ‘fair’ with ‘eyes shining blue’. Only one of the portraits is in colour, and shows its unnamed subject to have blue eyes. Perhaps it is Blythe-Brown after all. Background image: New End Hospital Staff - Nursing Times December 1918. Courtesy of RCN archive. Most interesting year. On the whole made several new friends. 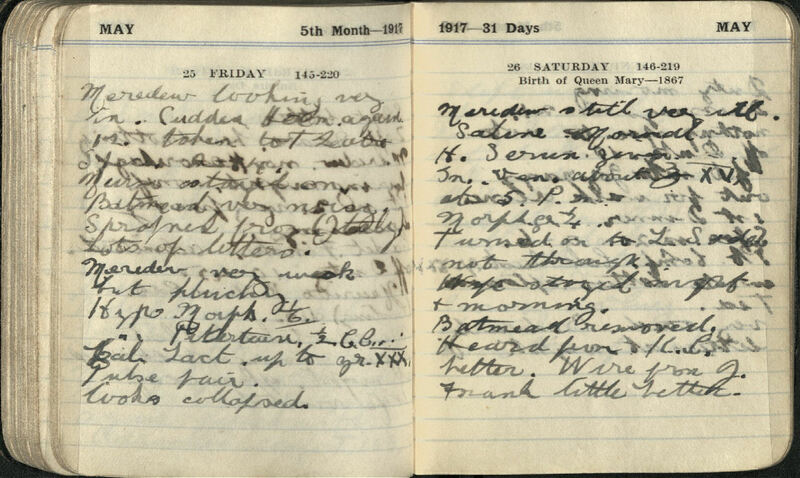 The entries in the scrapbook also suggest that she enjoyed a friendly relationship with her patients. It appears patients felt comfortable enough to include whatever they wanted. Many of them chose to write Blythe-Brown jokes and riddles, surely reflective of her good nature. Only a patient confident of his nurse’s good humour could pen such a cheeky note as the one entitled ‘for gentlemen only’, which when opened states boldly ‘ain’t nurses nosey’. 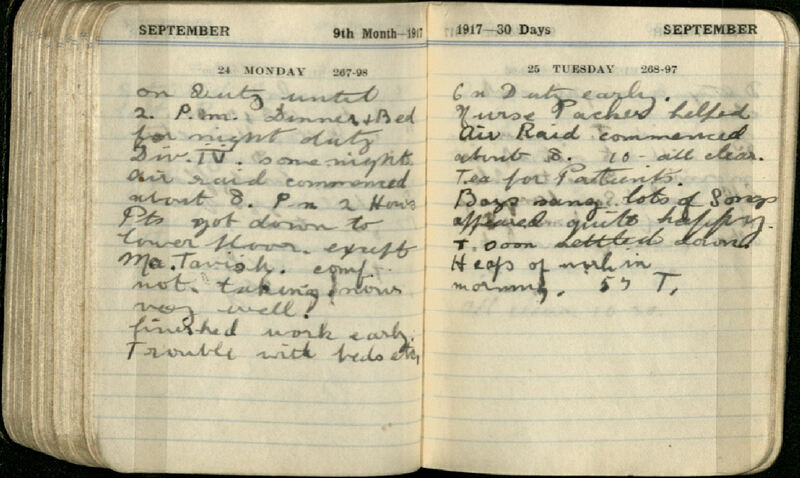 Her diaries are filled with the activities she shares with the ‘boys’ (her patients). It seems she was always singing with them, baking cakes and even making them poached eggs. Blythe-Brown’s humour was appreciated by her patients, but this sometimes extended itself beyond the sphere of friendship. Her ward sister, Sister Wilson, told Rush that if a young man did not propose to Blythe-Brown at least once during convalescence then he wasn’t a normal man. Certainly, her scrapbook is filled with enough enthusiastic declarations to suggest this was the case. 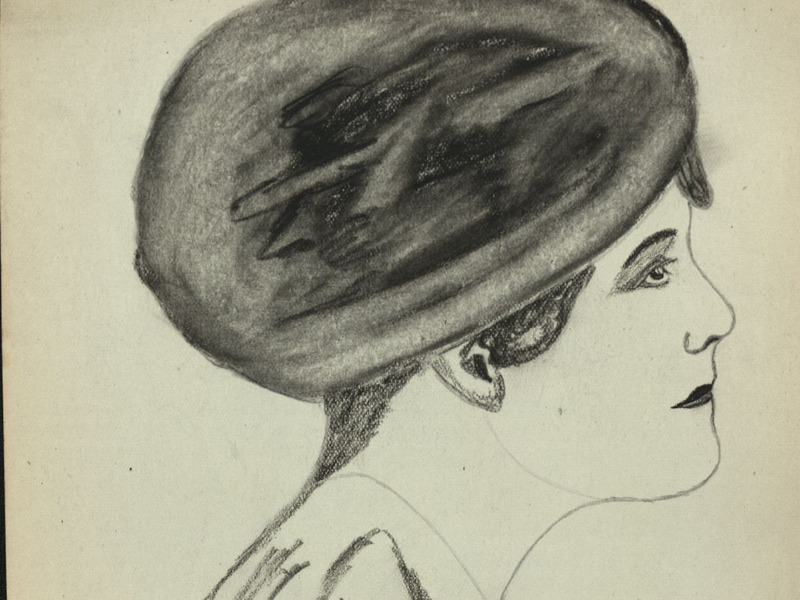 Another patient, who signs ‘vagabond’, writes of ‘Her eyes such fascination send, As my poor heart can scarce defend’. He too, it seems, was under Blythe-Brown’s ‘spell’. Curiously he has addressed the poem ‘To Brutus’. Perhaps Blythe-Brown had refused him. 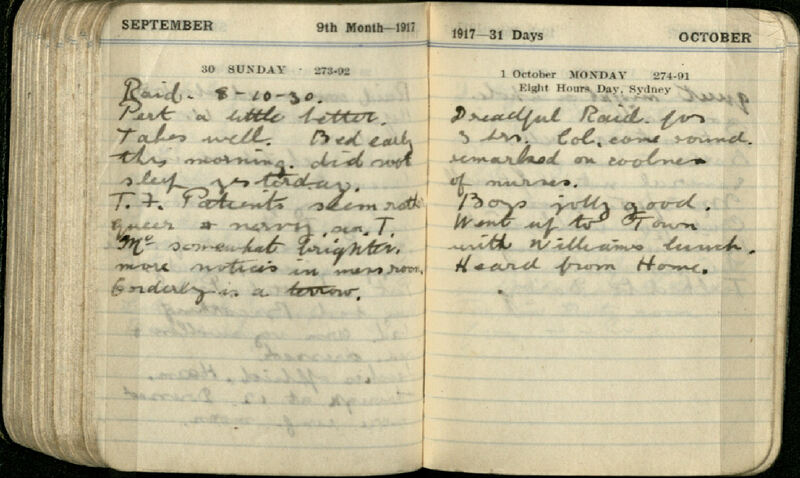 Despite his passion, there is no mention of the forlorn ‘vagabond’ poet in the corresponding day in her diary. The attachment seems to have been rather one-sided. Not all of the entries in Blythe-Brown’s scrapbook are taken up with flirtation. Some of the patients write about their experiences in war. Blythe-Brown spent her war years in the Hampstead hospital. She would not get close to the front line clearing stations some nurses were posted to. 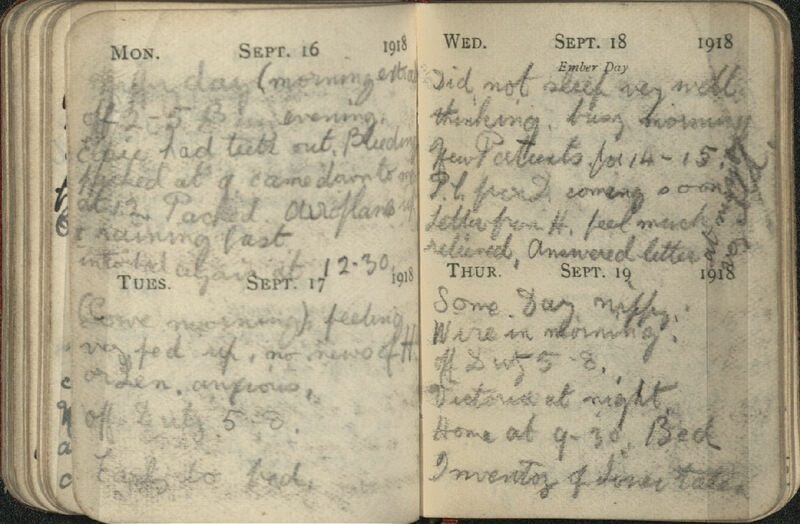 The accounts of the men she was nursing in her scrapbook would have helped her better understand their experiences. Thomas Daly writes of ‘bayonets dark with thickening gore’ and ‘fiendish weapons of death’. Others take a more patriotic view of their time. In his poem ‘Our King and Country Need Us’ McClory makes light of the front line, writing ‘we are not downhearted, In spite of slush & mud’. Trench fever was a serious problem, with almost a million soldiers estimated to have been ill with it by the end of the war. Symptoms included a sudden high fever with severe headache, a rash and back and leg pain. It could take up to a month to recover, and relapses were common. Whilst Blythe-Brown nursed, the medical community debated trench fever’s origin. 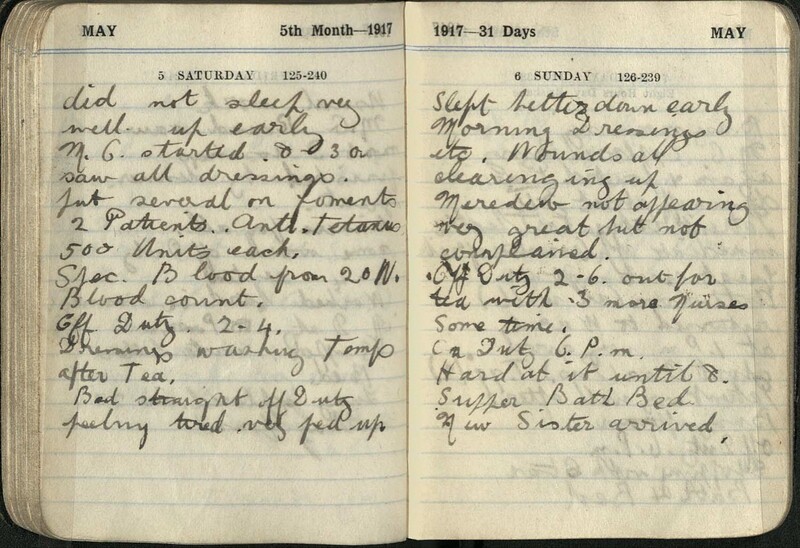 In 1918 researchers at New End Hospital concluded trench louse excrement was to blame. 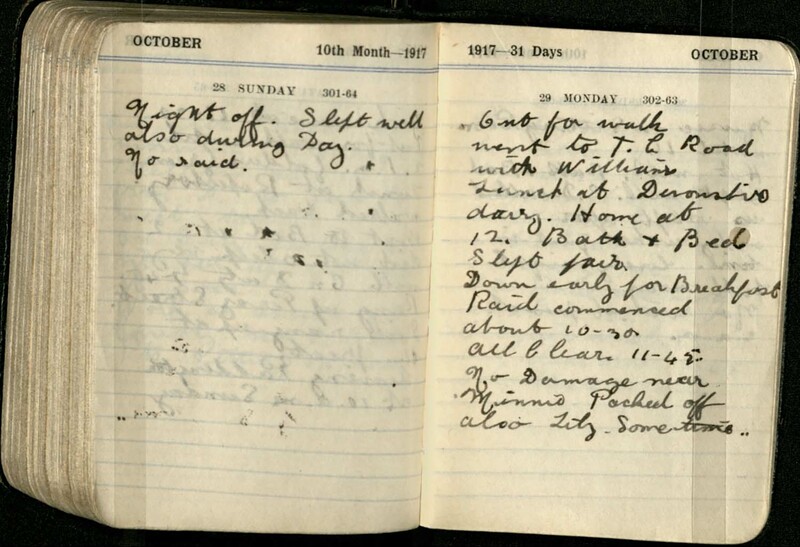 Blythe-Brown’s diary entries are mainly short entries about her day to day life - the time she got up, and went on duty – how her mood was and what she did in her spare time. Her diaries are tiny books that do not lend much room for excessive detail. 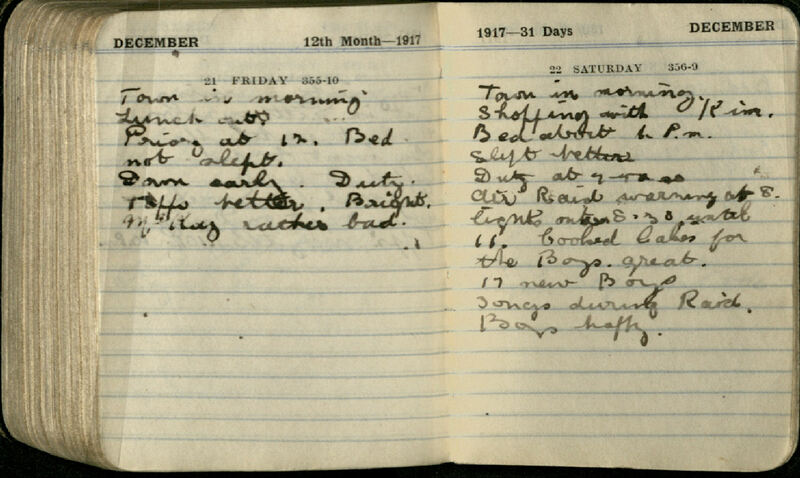 Her diary for 1918 is a miniscule 54mm x 70mm. Despite its small size, Blythe-Brown still finds space to write entries about her patients, new admissions or methods of treatment she was using. A patient called Meredew particularly worried her. 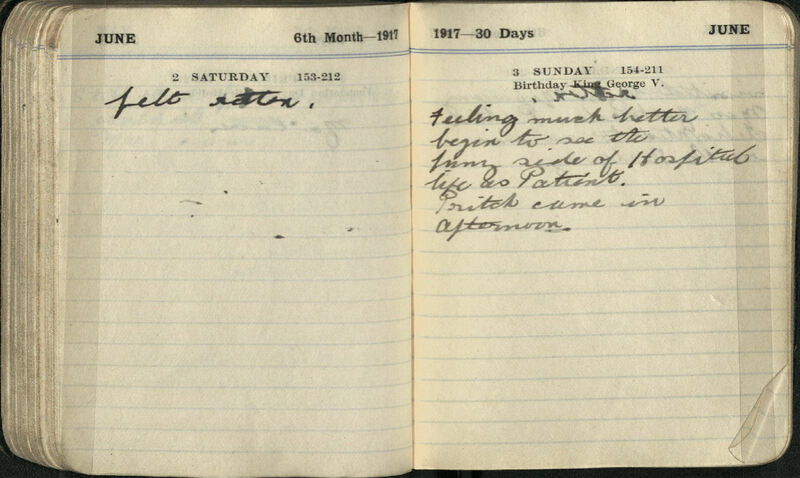 He is first mentioned in the diary in May 1917. 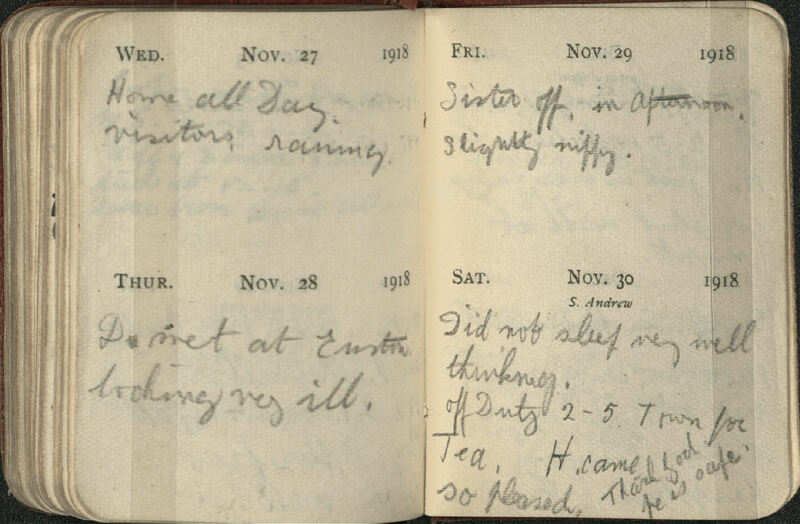 Several diary entries describe his condition which appears to be deteriorating. 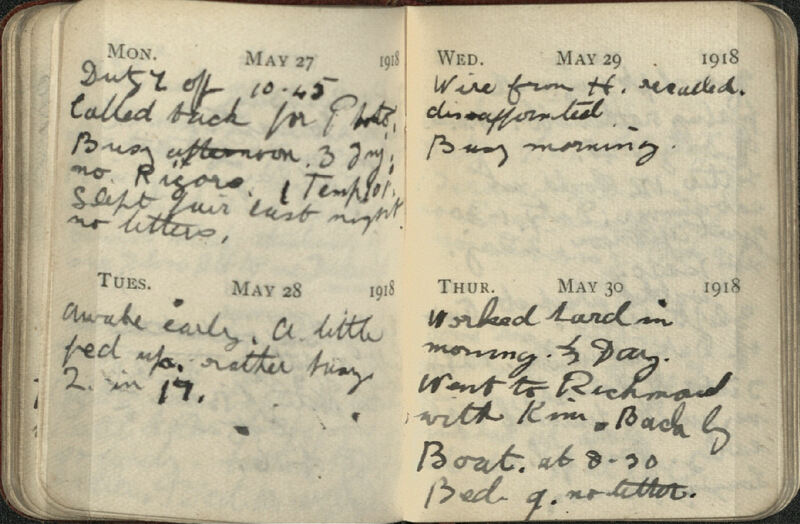 On the 25 May he haemorrhaged (probably not for the first time as packing a wound with adrenaline is mentioned earlier) and is described by Blythe-Brown as ‘very weak but plucky’ and ‘pulse fair looks collapsed’. 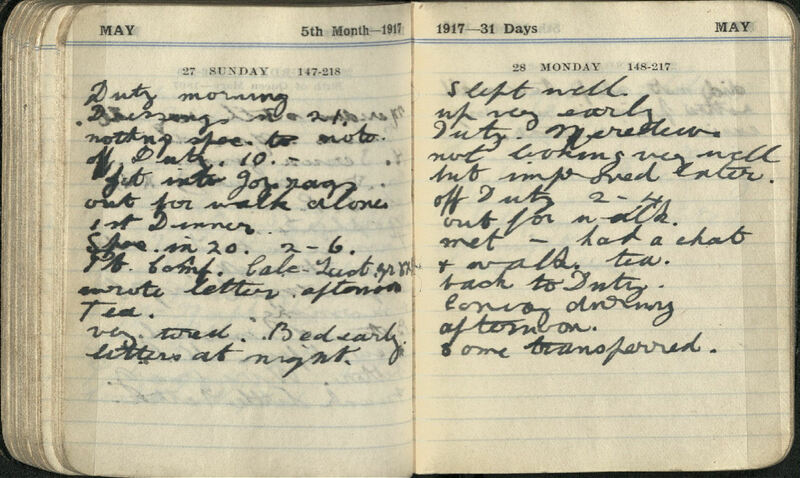 Although the following day he was ‘not looking very well but improved later’ his outcome is unknown as Blythe-Brown herself became unwell the next day. She was ‘brought to Chelsea at 3pm operated 5’. After a few days of feeling ‘rotten’ she began ‘to see the funny side of hospital life as a patient’. Again, her good humour shines through. She also problems with her teeth at this time, and visited the dentist on multiple occasions. 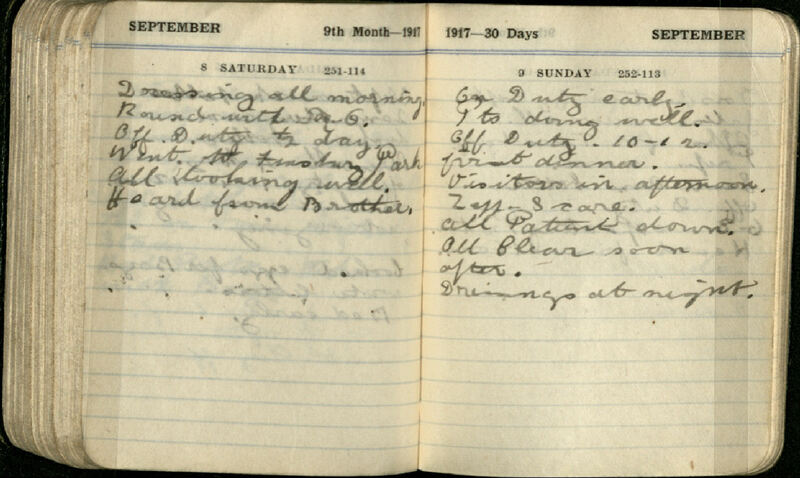 After problems with her wound ‘oozing’ she finally went back on duty on the 1 September. 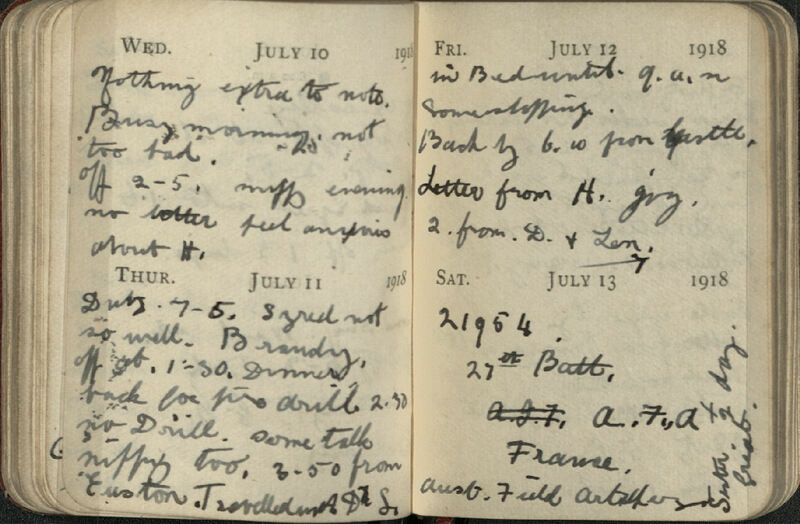 Although Blythe-Brown did not go overseas, she did experience enemy action in the form of air raids. 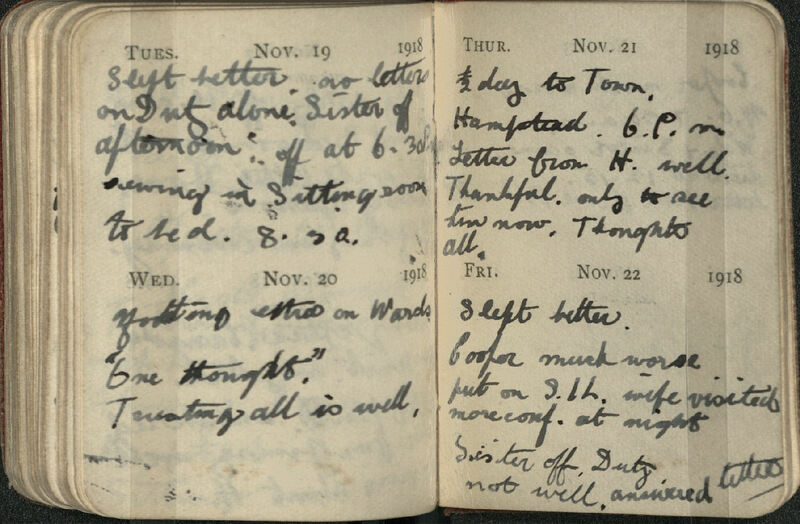 Throughout 1917 these became quite regular, and Hampstead was hit on many occasions. 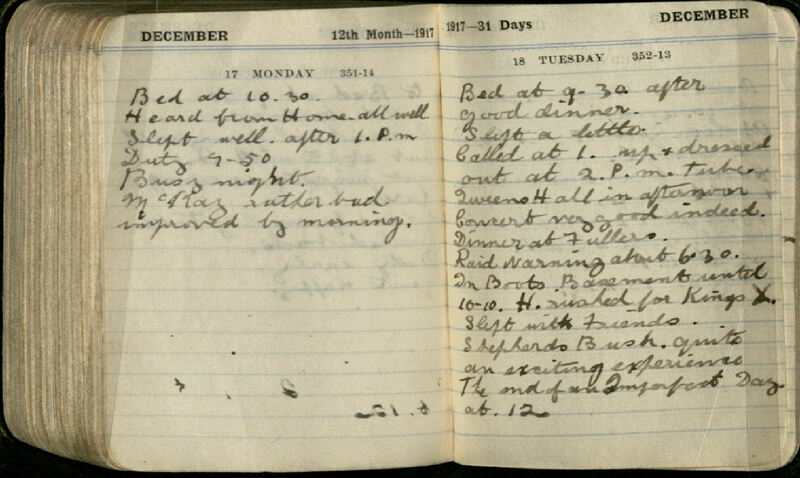 On 18 December she went to a concert and dinner with someone she mysteriously refers to as ‘H’. 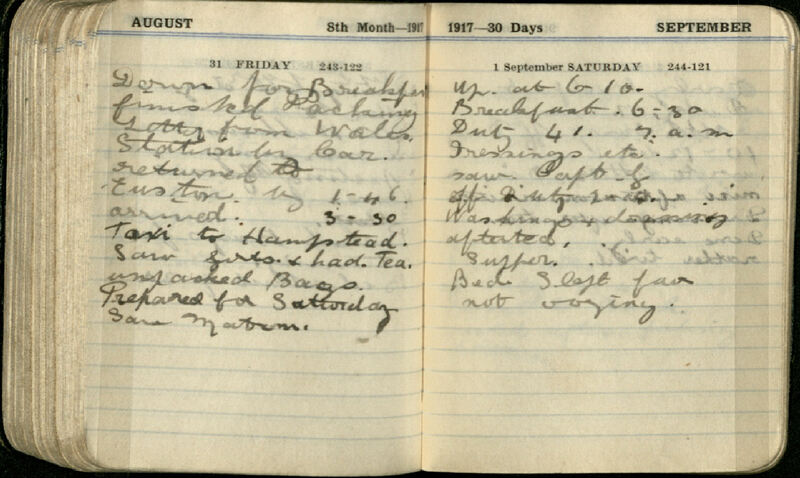 There was an air raid warning at 6.30 and they sheltered in Boots Basement until 10.10 - ‘H rushed for Kings X’ and Blythe-Brown slept with friend at Shepherds Bush ‘quite an exciting experience’. 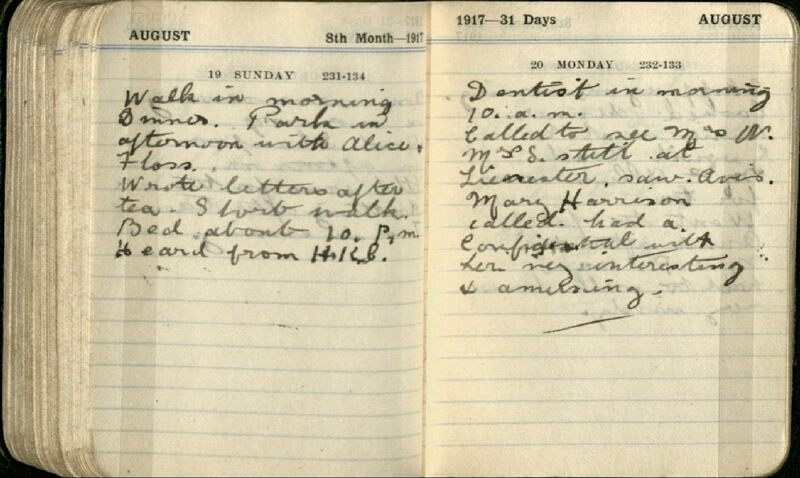 Throughout her diary there are several mentions of ‘H’ and ‘H.R.C’ as someone she is particularly concerned about. According to family friend Rush, Blythe-Brown was engaged to a soldier. This is most likely ‘H’. 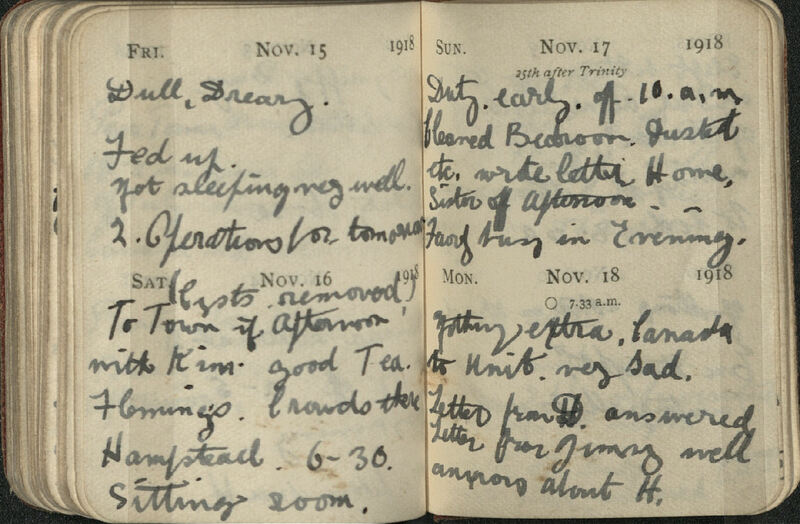 Her diary entries are peppered with concern about him being abroad. Although she does not say, it’s probable ‘H’ was the soldier fiancé Rush was referring to. She would go weeks without receiving word from ‘H’, which is often tied in with her loss of sleep. 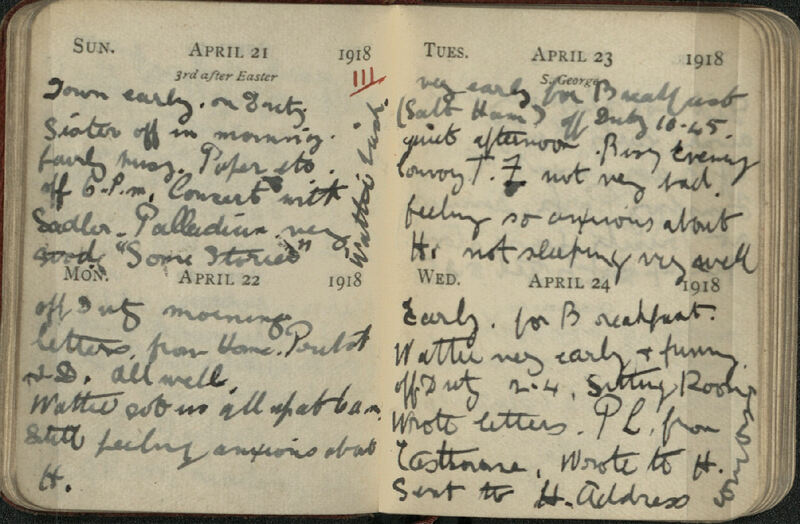 On 23 April she was ‘feeling so anxious about H. Not sleeping well’. 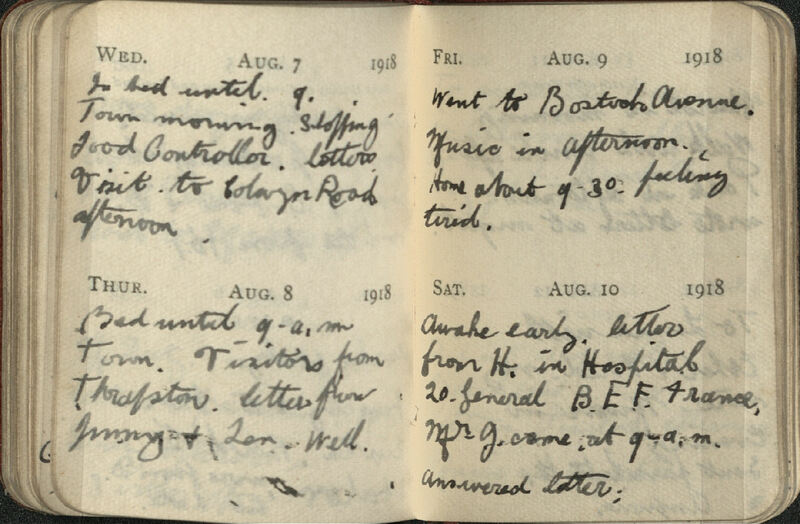 She received a letter on the 10 August saying he was in hospital in France. Blythe-Brown does not mention why ‘H’ was hospitalised, or say how she felt about this. The war would end before she would see him again. 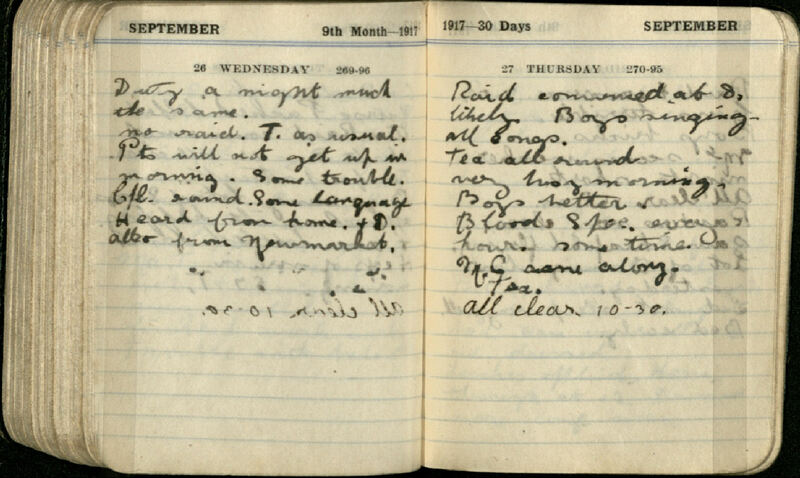 11 November 1918 marked armistice. 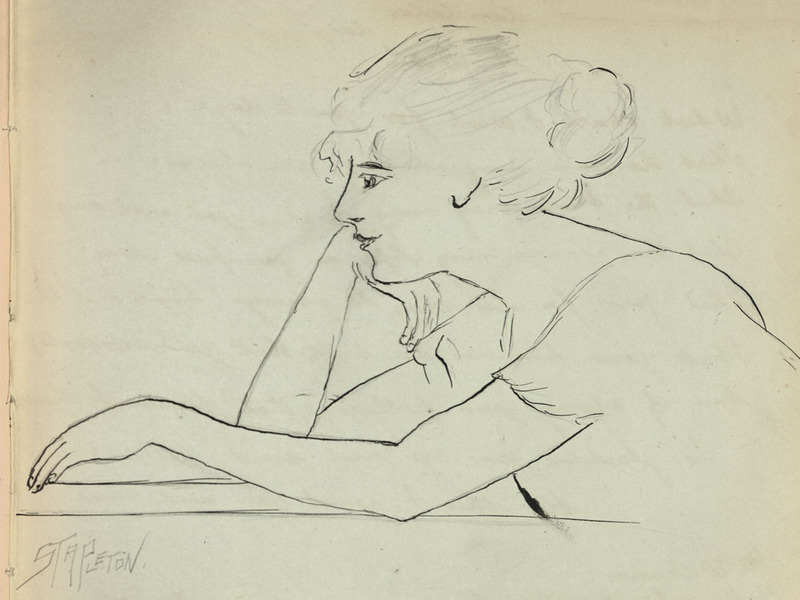 Blythe-Brown writes the event in her typically brisk manner. Peace terms. Armistice signed. 11am. Guns etc. Her lack of excitement over this announcement may be due to her continuing worry for ‘H’. They were to be reunited on the 30 November. 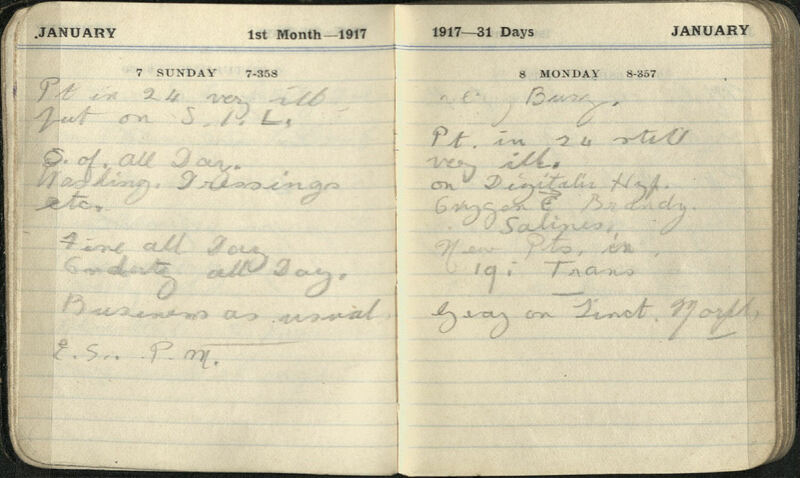 The pages of her scrapbook show that Blythe-Brown continued to nurse in New End hospital at least until 1919. When this came to an end, so did her relationship with ‘H’. Blythe-Brown broke it off to return home to Northampton to care for her elderly mother and invalid sister. Her sister, Anne Inwood, had been struck by lightning whilst pregnant. Blythe-Brown stayed in Northampton for the rest of her life, and worked as a district nurse and midwife. Blythe-Brown died on the 27 June 1966, aged 79. She left her estate to Kenneth Rush, a retired boot manufacturer. Presumably he was a relative of Mary Rush, who provided anecdotal evidence of Blythe-Brown’s life, and donated her books to the RCN. New End Hospital Staff - Nursing Times December 1918. Courtesy of RCN archive. Coward, Noël, Coward Revue Sketches. A&C Black, 13 June 2014. 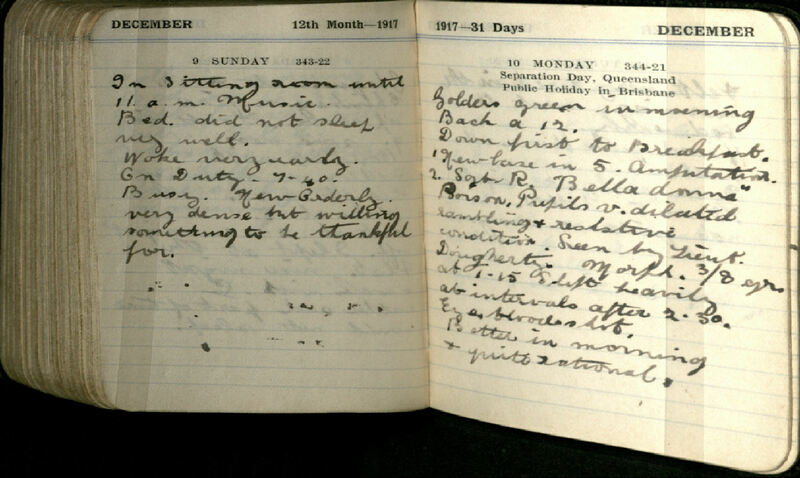 Anecdotes of Mary Rush regarding Florence May Virtue Blythe-Brown, RCN Archive, Reference Number C446. Newspaper cuttings regarding research into trench fever at Hampstead War Hospital, RCN Archive, Reference Number C446. BBC News. (2018). Zeppelins wrought terror from sky. [online] Available at: http://www.bbc.co.uk/news/uk-england-27517166 [Accessed 15 Mar. 2018]. Family Search. (2018). [online] Available at: https://www.familysearch.org/ [Accessed 15 Mar. 2018].